Welcome to NewYork-Presbyterian/Columbia University Irving Medical Center. Here you will find a staff dedicated to always providing the highest quality, most compassionate care and service to each and every one of our patients and their families in a warm and friendly environment. 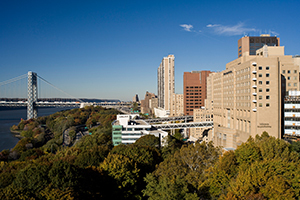 NewYork-Presbyterian/Columbia University Medical Center is part of NewYork-Presbyterian, one of the nation’s most comprehensive academic health care delivery systems, dedicated to providing the highest quality, most compassionate care to patients in the New York metropolitan area and throughout the globe. In collaboration with two renowned medical schools, Weill Cornell Medicine and Columbia University College of Physicians & Surgeons, NewYork-Presbyterian is consistently recognized as a leader in medical education, ground-breaking research and innovative, patient-centered clinical care. Take the 1, A, C, trains to the 168th Street station. From midtown Manhattan, the A train provides express service. A number of city buses serve the medical center: M-2, 3, 4, 5, and 100 and Bx7. The most direct way to NewYork-Presbyterian/Columbia from most locations is to follow directions leading to the George Washington Bridge, then exit onto the Henry Hudson Parkway, and then onto Riverside Drive (south). From there, continue south and turn left onto 165th Street (the first left south of the bridge). Proceed one block and turn right onto Ft. Washington Avenue, then turn right into the Medical Center parking garage. From Upstate New York and New Jersey: After crossing the George Washington Bridge, follow signs to the Henry Hudson Parkway (also called the West Side Highway), and then to Riverside Drive. From Riverdale and Westchester via the Saw Mill River Parkway: Exit the Henry Hudson Parkway at the Riverside Drive exit immediately past the George Washington Bridge. From Westchester, Connecticut, and the East Side of Manhattan via the Major Deegan, Cross-Bronx Expressway, or Harlem River Drive: Approaching the George Washington Bridge, take the Henry Hudson Parkway exit; on the approach to the Hendry Hudson Parkway, stay to the left and follow signs to Riverside Drive. Starting Jan. 5, 2019, 1 trains will bypass the 168th St. subway station at NewYork-Presbyterian/Columbia University Irving Medical Center until early 2020.